Zane and Pat Mulhausen built their home and winery in the Chehalem Mountains. They started planting their vineyard in 1973. A total of thirty acres were planted mostly to Pinot Noir, Riesling, Chardonnay and, surprisingly, five acres of Sylvaner (a white wine grape). The winery was bonded in 1979 and released its first wine. The first Sylvaner wine was released in 1986. Zane was the winemaker and Pat staffed the tasting room and conducted tours. 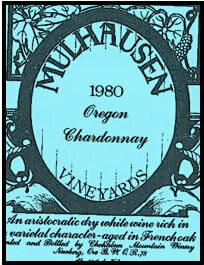 Originally the name of the winery was Chehalem Mountain Winery but later changed to Mulhausen Vineyards. The Mulhausen’s sold the winery in the late 1980’s; it’s not known who purchased the property. The winery’s address was: Jaquith Road, Route 1, Newberg, Oregon. Mulhausen was enthusiastic about the potential for the Sylvaner grape, which was not widely planted in Oregon.